1) Dean Ambrose: Boy, what a tough week. Several people with big accomplishments missed the cut including Lashley, Drago, Aerostar, Fenix, Rey Mysterio and Matanza Cueto. To kick things off, I'm going with Dean Ambrose. First of all, he defended his WWE World Heavyweight Title against Seth Rollins in a match that ended in controversy. He was then taken second overall in the draft the following night and closed out that show by defeating the number one overall pick, Seth Rollins and retaining the title. His biggest moment came at the Battleground Pay-Per-View though. 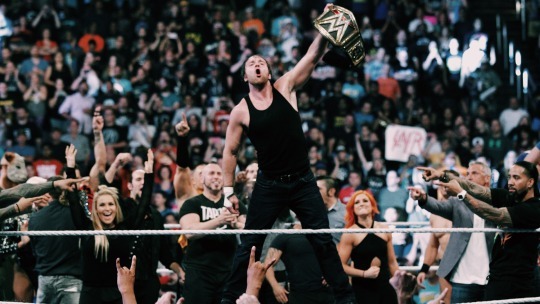 In the highly anticipated Shield triple threat match for the belt, Ambrose bested his former brothers to keep the title. It was a clean win that doesn't allow for any title shenanigans to move the strap to Raw. He pinned Roman Reigns and a win like this solidified his title reign. 2) Sami Zayn: Easily, the best match of a week full of them was Sami Zayn's final encounter with Kevin Owens. They stole the show at Battleground and put on a match of the year candidate. Zayn was able to finally exorcise his demons and defeat his former best friend. The match featured tons of callbacks to past matches, lots of near falls, drama, a hot crowd, great wrestling and everything I could want in a match. Earlier in the week, Zayn was also taken ahead of Owens in the draft, being one of the televised picks to go to Raw. He also won on Raw, teaming with Cesaro to defeat Chris Jericho and Kevin Owens. Zayn has been one of the best performers all year long in any company and it continued this week. 3) Hiroyoshi Tenzan: There have been plenty of surprises early on in the G1 Climax. From an 0-2 Hiroshi Tanahashi to a 2-0 Tomoaki Honma, things are off to a strange start. However, I'm going with Hiroyoshi Tenzan's 2-0 start over Honma's. While Honma's is more surprising, Tenzan's is a better story. After not being selected to participate, Tenzan's partner Satoshi Kojima gave him his spot. It marked the 20th straight appearance in the G1 for the former three time winner. On night one, Tenzan defeated Tomohiro Ishii in an awesome match, silencing a lot of doubters who thought his inclusion was a bad decision. Then, on night three, he defeated Tama Tonga to move to 2-0. I don't think he wins his block, but it would be one hell of a story. 4) Bayley: When the WWE Draft came and went, there was a lot of confusion and sadness about Bayley. Everyone wanted her to get drafted, but they watched Alexa Bliss, Carmella, Nia Jax and Mojo Rawley get taken, while she stayed in NXT. However, at Battleground, Sasha Banks needed a mystery partner and brought out Bayley. The pop Bayley received was one of the best I've heard all year, male or female. She teamed with Sasha and they worked together to defeat Charlotte and Dana Brooke. It was Sasha who got the win for the team, but the moment of Bayley arriving was great. Unfortunately, Bayley confirmed it as a one time deal because she is focused on the NXT Women's Championship. 5) Tomoaki Honma: After winning one match combined in the past two G1s, Honma began this year 2-0.